An agri-tech company that makes a low cost, high-quality hydroponic system with the aim of disrupting the state of global agriculture towards more socially and environmentally sustainable practices. 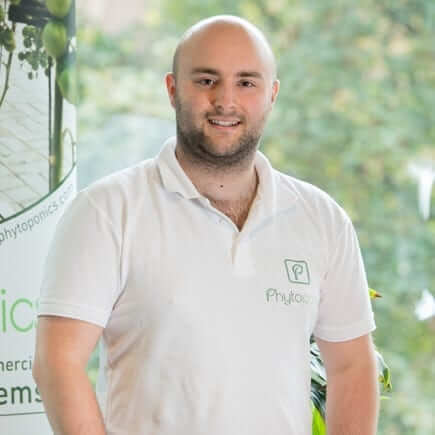 Phytoponics was founded in 2016 by Adam Dixon and Luke Parkin, aiming to commercialise a unique, patent-pending hydroponic design invented by Dixon himself. Hydroponics is the growing of plants without using soil – this method greatly reduces the amount of land, water and fertiliser needed to achieve the same yield of produce. Traditionally hydroponic systems incur very high costs to purchase and install, putting off farmers. Phytoponics aim to change that through their low-cost Hydrosac, which will allow farmers to more easily switch into this more sustainable method of farming. A high quality, low-cost hydroponic system that allows growers to easily and quickly switch to a method of farming that uses a fraction of the water, fertiliser and land. Harvest the delicious tomatoes from our first field trial in Wales. Secure further funding to vastly scale-up to a second field trial on a pilot farm (2 thousand square metres). Provide a low cost, environmentally friendly way to meet growing global food demand. Pre-Series A funding for our second field trial. Continue developing our product to achieve the highest quality for the lowest cost. 2018 – Phytoponics nominated as a Climate Trailblazer for the Global Action CLimate Summit in San Francisco. September 2018 – Phytoponics attends the Global Action Climate Summit. 2019 – A new round of funding and second scaled-up field trial begins.